How far would you travel you travel for theatre (excluding, of course, those silly enough to fly all the way to New York City)? For us, pretty far. We’ve gone 62 miles to the Chance Theatre (FB) in the Hills of Anaheim. We’ve gone 155 miles to see shows at theatres like the Cygnet Theatre (FB) or the Diversionary Theatre (FB) in San Diego. This weekend? We drove 328 miles to see Adrift in Macao at the Tabard Theatre Company (FB) in San Jose. I first learned about Adrift in Macao when I got the NEO: New, Emerging, Outstanding Musicals album back in 2007; I subsequently got the Off-Broadway cast album in 2011. I fell in love with the score: it was absurd and self-referential, and sounded quite interesting. So (as I am wont to do) waited for a production in Los Angeles. And waited. And waited. 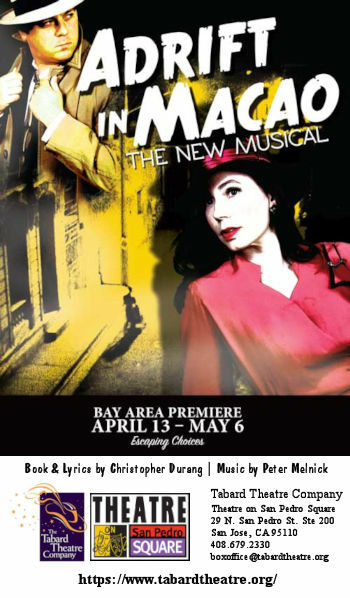 In 2014, I was visiting my daughter at UC Berkeley and was looking for interesting theatre, and found a production of The Immigrant at a small company, the Tabard Theatre Company (FB), in San Jose. It blew me away, and I joined their mailing list. When I learned they were doing Adrift in Macao as part of the their 2017-2018 season, I started to make plans — we ended up building a mini-vacation to see friends around the show (their 2018-2019 season isn’t bad either, and we’re thinking about coming up for Queen of the Mist). Heroes (or anti-heroes), corrupt characters and villains included down-and-out, conflicted hard-boiled detectives or private eyes, cops, gangsters, government agents, a lone wolf, socio-paths or killers, crooks, war veterans, politicians, petty criminals, murderers, or just plain Joes. These protagonists were often morally-ambiguous low-lifes from the dark and gloomy underworld of violent crime and corruption. Distinctively, they were cynical, tarnished, obsessive (sexual or otherwise), brooding, menacing, sinister, sardonic, disillusioned, frightened and insecure loners (usually men), struggling to survive – and in the end, ultimately losing. Storylines were often elliptical, non-linear and twisting. Narratives were frequently complex, maze-like and convoluted, and typically told with foreboding background music, flashbacks (or a series of flashbacks), witty, razor-sharp and acerbic dialogue, and/or reflective and confessional, first-person voice-over narration. Amnesia suffered by the protagonist was a common plot device, as was the downfall of an innocent Everyman who fell victim to temptation or was framed. Revelations regarding the hero were made to explain/justify the hero’s own cynical perspective on life. Ripe stuff for a parody, right? The music was by Peter Melnick, grandson of Richard Rodgers, composer of The Last Smoker in America, and numerous film scores. In the case of Adrift in Macao, our McGuffin is literally a Mr. McGuffin, whom nobody knows what he looks like, but everyone is scared of him. Enter Lureena Jones, who has been left with no money, no job, and only a slinky dress in Macao. She tries to hail a rickshaw, but instead hails Rick Shaw, owner of a seedy nightclub (yes, that is the level of jokes and absurdity in this). She talks him into hiring her as a nightclub singer. This pisses off the current nightclub singer, Corinna, who takes solace in her opium addiction. Into the nightclub comes Mitch, a downtrodden detective, accused of a murder he didn’t commit (he took the fall for McGuffin’s deed). He’s trying to find McGuffin to clear his name. He inquires of the bartender, Joe, and the Chinese worker, Tempura, to find Shaw in order to find McGuffin. You can guess how the story goes from there, with mistaken identities, stereotypical portrayals suitable for 1952 (the year of the movie), and a little support from the cigarette girl, Daisy. The production is filled with references to noir films from the 1940s and 1950s, as well as non-noir dramas and mysteries. I’m sure there are references that I missed, but I did pick up on quite a few. When I listened to the music, I found it absurd. Multiple songs to the same underlying tune, used for great comic effect. Watching the show unfold, I’m pleased to note that it was even more absurd than the music. I was laughing and smiling throughout. I was hearing numerous laughs from the friends we had brought with us to introduce them to the theatre. That’s not to say this is a deep or meaningful show in any way. It isn’t. It is silly and absurd. The plot is a McGuffin. It is self-referential. It used words it doesn’t even know the meaning of. But it is fun. Sometimes, you go to the theatre to have fun, and I think that was the concensus of our group. There were some problems at our show, all primarily technical. I’ll cover those later. However, performance-wise, it was great. Director Doug Baird (FB) is sufficiently familiar with the film noir conventions that he was able to work with his ensemble to bring them out in the performances in a hilarious fashion. This was augmented by the choreography of Jennifer Gorgulho (FB), which fit well into the film noir and various other styles (mambo) called for in this show. In the lead positions were Alicia Teeter (FB) as Lureena Jones and Tim Reynolds (FB) as Mitch. Both had lovely voices, which start the show out strongly in the numbers “In a Foreign City (in a Slinky Dress)” and “In a Foreign City (in a Grumpy Mood)”. They capture the noir aspects of their characters well, and were just a delight to watch. Very, very funny and (as appropriate) very very deadpan. Playing counter to the leads were Cami Jackson (FB) as Corinna and Derek DeMarco (FB) as Rick Shaw. Jackson had a lovely voice and style, and played well against her Teeter as her foil. About the only complaint is that the two had similar looks, and potentially a wig should have been used with one of them to provide more distinction. But that’s a minor quibble for what otherwise was an excellent performance with great comic timing, good dance, and a lovely voice on numbers like “Mambo Malaysian” or “Adrift in Macao”. DeMarco’s character has fewer numbers, although he shines in “Rick’s Song” and has great chemistry with Jackson’s Corinna (which is no surprise, as he is her real life fiancee). Perhaps the most problematic character in the show is the funniest as well: Joshua Lau (FB)’s Tempura. As written, this character is over-the-top stereotypical movie oriental, with all the problematic dropping of r’s, and inscrutability. But the writing makes clear that this is intentional tongue-in-cheek — this is 1952, and it is how Asians were written then. That doesn’t make it right or less offensive, but it does put it into the context of the show and of film noir — which was at its very nature both stereotypical, mysogynistic, and offensive in portrayals. By doing so, I think it was highlighting how those portrayals were absurd and wrong. Lau plays with this to the hilt, and seems to be having a lot of fun with it. He sings well in numbers like “Tempura’s Song” and the closing “Ticky, Ticky Tock” number, and is quite funny. Rounding out the cast in supporting ensemble roles as well as the indicated named roles were Emily Schmeichel-Frank (FB) as Daisy, the cigarette girl/waitress and Patrick Kelleher as Joe, the bartender (at some performances, Joe is played by Hank Lawson (FB)). Schmeichel-Frank draws the eye and is fun to watch when she is on-stage, and Kelleher (at our performance) had some great comic moments, and they moved well in their ensemble background numbers. Music was provided by an off-stage (behind a screen) five piece band, under the musical direction of Samuel Cisneros (FB), who also played keyboards. The remainder of the band consisted of Doug Forsyth (FB) [Keyboard 2]; Ron Bowman (FB) [Reeds]; Jerald Bittle (FB) [Drums]; and Linda Jansen (FB) [Bass]. Turning to the production side of the equation, starting with what worked. There is no program credit for scenic or set design; presumably, the director did that. Tabard has a quarter to third round stage, and this was designed with an oriental symbol in the center (with the band behind it), a bar space, and some table space, with some dancing space front and center. This worked, although the bead curtains to off-stage were a little noisy. The design was supported by Miranda Whipple (FB)’s props, which worked well. Mood and date was provided more by Melissa Sanchez (FB)’s costumes, assisted by Marilyn Watts (FB); there was no credit for hair or makeup. The costume designs seemed reasonably period, but I’m no expert in that area. Now for what was more problematic…. The sound design by John DiLoreto (FB) was great at some points (particularly the directionality of the sound during the hunt for McGuffin), but there were other times where actors drifted in and out of amplification. This could have been a board problem, but the sound designer is responsible for training the board operator. Similarly, Nick Nichols (FB) lighting design mostly work, but there were times performers were singing in the dark (meaning spot or position failures). Lastly, the bigggest flaw belonged to Technical Director Rover Spotts (FB): when the time came for the sing-along at the end (of “Ticky Ticky Tock”), the projection design wasn’t ready — they had to play catch up with opening and starting the presentation, and then the presentation was just words. It did add to the humor, but that wasn’t intentional. Rounding out the production credits: Charlynn Knighton (FB) [Production Manager]; Robert Lewis (FB) [Asst. Stage Manager, Board Operator]; Cathy Spielberger Cassetta (FB) [Producer]; Barbara Reynolds (FB) [Program Layout]. Speaking of programs: As this is a regional theatre out of a traditional theatre city (LA, NYC), most of the actors and the production team did not have professional bios online (there were perhaps two), and being Silicon Valley, many folks are smart and don’t have FB. But luckily, Tabard puts its program online so you can read the credits. There is one weekend left for Adrift in Macao. You can get tickets through the Theatre’s website; discount tickets may be available through Goldstar. The next event at Tabard is on May 10th at 7:00 PM, when the Tabard Theatre Company will celebrate its 10th year of being the resident and managing theatre company of Theatre on San Pedro Square. Information and tickets to this free event are available online. The next show will be a production of Love Letters, running June 8 – 24. The first show of their new season, Another Roll of the Dice, starts September 14th. This is the West Coast premiere, thanks to the death of the Colony Theatre (FB) which was about to produce the show when it informed subscribers that it was going belly up on hiatus for an indefinite period. As a side note: I was surprised at how many theatres there were in DTSJ – Downtown San Jose. Within walking distance of Tabard were: Broadway San Jose at the San Jose Center for the Performing Arts; the Montgomery Theatre, which also includes the City National Civic, the Center for the Performing Arts, and the California Theatre — all withing walking distance. Those are the largest; next on the size scale is the Hammer Theatre at SJSC, also managed by the city, and the Trianon Theatre. Going smaller, there’s the San Jose Stage Company, which looked to have a great season, and the City Lights Theatre Company. For someone used to LA theatre, seeing this concentration of theatres demonstrates that although the South Bay may have worse drivers than Los Angeles, it has a great theatrical community. The first weekend in May will bring School of Rock at the Hollywood Pantages (FB), with the following weekend bringing Soft Power at the Ahmanson Theatre (FB). The middle of May brings Violet at Actors Co-op (FB). The last weekend will hopefully bring a Nefesh Mountain concert at Temple Ramat Zion; the weekend itself is currently open. June — ah, June. That, my friends, is reserved for the Hollywood Fringe Festival (FB), including The Story of My Life from Chromolume Theatre (FB). I’ve begun planning my scheduling using the HFF18 information, and it looks like we’ll be seeing 19-20 shows over the weekends in June. More on that when the schedule finalizes. Additionally in June we’re seeing the postponed Billy Porter singing Richard Rodgers at the Saroya (the venue formerly known as the Valley Performing Arts Center (VPAC)) (FB), The Color Purple at the Hollywood Pantages (FB), and possibly Do Re Mi at MTW. The latter, however, is on a Sunday night in Long Beach, and so Fringing may win out. July will get busier again. It starts with the 50th Anniversary of Gindling Hilltop Camp, followed by On Your Feet at the Hollywood Pantages (FB). The next weekend brings Jane Eyre The Musical at Chromolume Theatre (FB). The third weekend in July brings a Bat Mitzvah in Victorville, with Beauty and The Beast at 5 Star Theatricals (FB) that evening. The last weekend may be a Muse/ique (FB) show. August starts with Waitress at the Hollywood Pantages (FB).